If IV and V are $3 I'll buy both. Aaaand purchased~ I didn't realize it was going to be so inexpensive! Convenient, since I have a tiny bit of cash on my cash card, ha hah! 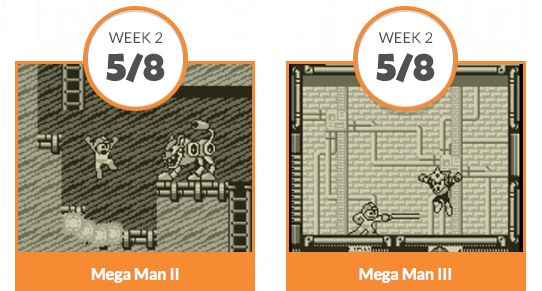 Mega Man II for the Game Boy is hardly worth picking up for free . . . I can't say I agree with that. This may sound strange coming from me, of all people, but I honestly don't understand all the hate for that game. I have yet to find anything about Game Boy Mega Man II that singles it out as the blacksheep of the GB series. Eh the only problem with the game is that it was too easy. Oh and the instruments used for its music were too high pitched. I wonder if a lot of II's hate comes from sharing it's name with the most popular Mega Man game ever made. I honestly have a lot more good memories with this game than bad, even to this day. While I'll admit the music is a bit annoying to hear, thanks to the really high pitched instrumentals used. The notes themselves, especially when remixed with better or more capable people shows that at least in a composer standpoint, the folks who did the music for MegaMan 2/Rockman World 2 knew what they were doing. I just played through the entire game last night. People can say what they want, but I still say Mega Man II is my favorite game of the Game Boy series. It's just different enough to really stand out. A lot of people find that to be a bad thing, of course, but I find its unique features very interesting. The second half of the game is also kind of challenging... if you like using boss weapons a lot, that is. I found myself with a bunch of empty weapons by the end of the game due to the fact I was using them all. The game is perfectly playable and winnable without them, but I think going through the stages with the boss weapons is fun. I'm in total agreement than the music is too high-pitched for its own good. If they'd just knocked it down an octave, it would've sounded pretty great. Despite that, the music is pretty catchy and the reuse of the title theme for the Wily stage is a nice touch. All and all, I'm glad this game got re-released. And if the Miiverse is any indication, people are really enjoying it, despite it's weirdness. I paid $3.14 for mine after tax and I think I got a great deal. I'm happy to see other people enjoying it, as well. Haha, I wondered if that would incite some rebuking! My concerns with it were that it was way short (not a death blow) and the music was pretty bad, especially compared to the source material. and it's done. i beat MM1 and X6 3 times 100% on hardest difficulty and saved all reploids. I'll be picking these up on payday. Not my favorites of the portable games, but there's hardly a such thing as a truly bad Megaman game (maybe the DOS games). II had the screechy music, but I enjoyed the remixed level designs, and III at its worst is probably just the least memorable, but still fun. The 3DS sure is getting a lot of Megaman love lately. At this point it has more Megaman games on it than the original NES, and by the end of this month will have a total of 13 Megaman games (not counting backward compatibility with DS games). By comparison only the Gamecube at 18 games (10 in anniversary collection, 7 in X collection, and Network Transmission), and the PS2 at 19 (Same 2 collections, Minus NT, Plus X7 and X8) would have more. Let's hope this shows Capcom that people still love Megaman, and we'd be happy to see more. Of course at some point Capcom Japan is going to have to pull their heads out and realize that sales in the west do mean something, as dollars (and Euros and Pounds) spend every bit as well as Yen.